CLEVELAND (AP) The Indians avoided salary arbitration with new catcher Kevin Plawecki, who agreed to a one-year contract for $1,137,500. 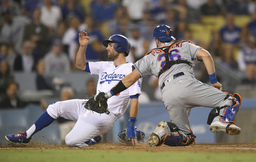 The 27-year-old Plawecki spent six weeks last season on the disabled list with a broken left hand. He threw out 23 percent (16 for 70) of potential base stealers and had two four-RBI games.